I have never really been a fan. I could probably count the number of times I watched her on TV on both hands, and while I have looked at her magazines I don't know that I've ever actually bought one. I just have never been into the cooking/crafts/homemaking thing all that intensively, but I knew that there are others for whom she is nothing short of a goddess of domesticity. And while I was never a "fan" I always had tremendous respect for her as an individual and a woman, a strong personality and character that built an empire, was ahead of her time in the gourmet food and "good life" movement, and a businessperson of steel. Last night I got to meet her and hear her speak, this doyenne of the "good long life" - and I am now more than a fan. I am completely enamoured with her, but not because she knows how to wield a glue gun or a wooden spoon. Martha Stewart is not what I thought she would be. I suppose in my head I imagined her as a bit Margaret Thatcher-esque, imperious and a bit haughty, as one would expect of someone who has achieved the kind of fame she has garnered in her lifetime. But she is none of the things I expected. She is genuine, and warm, and lovely. She is a domestic goddess, no doubt, but she is also an advocate for the elderly as I learned last night, a subject so close to my heart after spending years watching my parents age and helping them to meet the challenges along the way. She is a lover of animals, with a menagerie of pets (oh, how similar this is to me), and a single child, her daughter (once again a similarity). She has had a marriage fall apart (the similarities mount), and she loves to write, perhaps more than anything else she does (and once again, how similar we are in this regard). Last night I had the opportunity to meet her with her in a small group, and then to see her interviewed on the stage as part of the Northern Insights Speaker Series from the Fort McMurray Public Library. Carolyn Goolsby, our library Director and someone I am proud to call a friend, deftly interviewed Martha about her life, her triumphs, her challenges, and her accomplishments. There were moments of laughter, like when Carolyn admitted her inability to identify plants and Martha challenged her with the floral centrepiece on the table between them. Carolyn correctly identified a rose, and then Martha pointed to another flower and said "This is an anemone", to which Carolyn wittily replied, "Well, with friends like these...", leaving unsaid but hanging in the air the punchline "Who needs anemone (an enemy)?". It was a lovely exchange between these two, wide ranging and covering topics from Martha's childhood to her advocacy for seniors. Much of it was devoted to the concept of living "the good long life", a tenet to which I easily ascribe as I too believe whole-heartedly in this idea and finding ways to balance our lives to achieve mental and physical health. She talked about traditions, and the importance of keeping them and sharing them with others, which is another thing I am so very passionate about. She spoke of "cleaning up your act" and "editing" your material possessions, something I did this past year when I downsized and gave away so many things that I simply no longer needed. She spoke of the need to "make something", and how even those of us who work long hours and late shifts and several days in a stretch can sit down and pull out our sewing machines and make something (although for some of us what we make is words on a page, which is what I make in my free time). My ears perked up when she talked about cat-proofing your Christmas tree, as Sirius Black and I are in a serious showdown these days as he has learned that glass ornaments shatter in the most entertaining way when they are batted down the stairs, and more than once I have entered my living room to find a large black furry ornament settled in about halfway up the tree, green eyes blinking lazily at me from amongst the artificial-snow covered branches (and if glitter is the herpes of the craft world then artificial snow is the herpes of Christmas decorations, as I was absent-mindedly plucking small bits of it off my skirt as I sat listening to Martha, and my entire house is covered in kitty tracked artificial snow these days). She touched briefly on Fort McMurray and the oilsands, but it wasn't the focus of her talk, and nor should it have been in my opinion. I was intrigued during the media meet and greet when some of the questions focused on this aspect of who we are, and I was bemused as sometimes we are so ego-centric when it comes to the oilsands and what we think it means to people. I recall so well being in London, England just after the "don't visit Alberta and support the tarsands" billboards came out and going into a coffee shop right under one of those billboards. The older lady behind the counter began to get my tea and asked where I was from. I said Fort McMurray, Alberta, and she said "oh". I said "You know, the oil sands?" and she blinked at me. Finally I said "You know, the tarsands? ", waiting for her reaction...and she said "That's nice, dear, milk or cream with your tea? ", and I realized how absurdly important we think we are, and how we really might not matter that much to most people at all. Martha spoke of how she will blog about Fort McMurray, and about how much she had learned - which brought her to her life credo, which happens to again be another personal similarity. Learn something new every day. A simple credo, but it is one I cling to. A successful day for me is one where I have learned something new, even if I happened to make a mistake along the way and that is how I learned it. 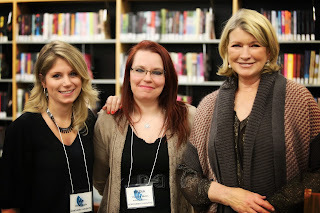 A really spectacular day is when I have learned several new things, or even been proven wrong, just as happened yesterday when I learned so much about this force of nature known as Martha Stewart, and learned what an incredible person she is. There is steel in that person, and don't let her gentle demeanour fool you, but it is the kind of steel that means she has been able to face her challenges and rise above them, retaining her dignity, her confidence, and her fans. And speaking of her fans I took one of them along with me, one of my coworkers of whom I am very fond and who was tremendously excited when she learned Martha was coming here. I arranged to bring her as my guest, so she too was able to meet and talk to Martha, even having Martha sign her wooden spoon (a request that caused much laughter and was, in my opinion, the high point of the meet and greet). I went home last night thinking about Martha, of course, but also about far more. I was thinking about this speaker series, and about how calling it a "success" was an injustice - because the Northern Insights Speaker Series hasn't been a success this year. It has been a smash-hit, home-run, hit-it-out-of-the-ballpark, win-the-Superbowl kind of success. It has not only opened new dialogues with people like Malcolm Gladwell, Bill Cosby, Arlene Dickinson, and Martha Stewart - it has actually changed the dialogue both within and about this place. Malcolm Gladwell, one of the greatest minds of our time, had approximately ten speaking engagements this year, and one of the few in Canada was right here. Bill Cosby, an iconic entertainer, now can find Fort McMurray on a map, which he admitted he could not do before. Arlene Dickinson made connections with people here like our young philanthropist Nathaniel Crossley and my own Intrepid Junior Blogger. 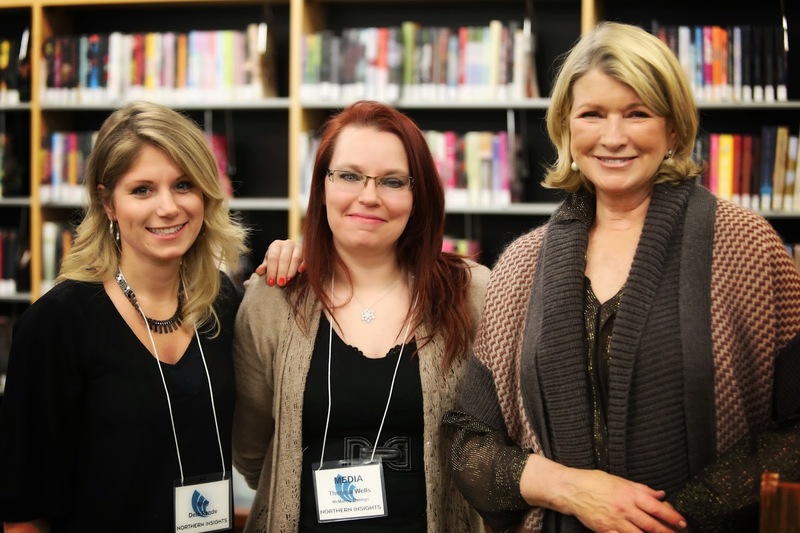 And Martha Stewart is going away with new knowledge of a place, people, and industry which will no doubt impact her just as her visit has impacted us. This past year thanks to the Fort McMurray Public Library, their leadership, and their board, I have had the opportunity to hear four incredible individuals from very different fields speak about their work, their lives, their thoughts, and their view of the world. I have had the astonishing and humbling opportunity to meet with them directly, and I will never forget it, particularly my chat with Gladwell and his mention of me on stage that night during his talk, and the IJB's interaction with her idol Arlene Dickinson. I will never forget the twinkle in Bill Cosby's eye when he chided me for showing too much leg when my skirt slid up when I sat beside him, and I will never forget how Martha Stewart surprised me with her warm sincerity, and her tremendous internal strength and integrity of her beliefs. We have been so fortunate this year, all of us who have been able to participate in this series. I have been even more fortunate than most, perhaps, because this series has had a deep personal impact on my life, and the life of the IJB. I am so grateful to the FMPL and all involved in presenting this series, and I am so thankful to Malcolm Gladwell, Bill Cosby, Arlene Dickinson and Martha Stewart for coming so far north to visit us and share with us while we share ourselves with them in return. The Northern Insights Speaker Series is concluded for this year - as they say in the movie biz "That's a wrap" - but it is only over for 2013, and based on the success of this year I cannot even imagine what is ahead for 2014. I know this, though. I know that this is what happens when we dream big, act boldly, and chase our goals, no matter how lofty they seem to be. I know that just over a year ago if you had told me I would meet four icons this year right here in Fort McMurray I would have told you that you were nuts - and yet here I am today, savouring a year of learning something new every day, and some days learning so much that my mind won't stop going- and so much of that is thanks to the Northern Insights Speaker Series. So, to the Fort McMurray Public Library, the board of directors, Carolyn Goolsby, Dawn Sidoroff, and all the other library staff I say this: Thank you. Thank you for doing something that not only has changed our community, but touched lives, including my own. Thank you for being bold and visionary and for chasing those things others might deem unattainable. Thank you for Northern Insights 2013 - and here is to Northern Insights 2014!